Aunt Penny will be in touch with after she reviews the questionnaire and checks your location. This is normally within 48 hours. Private trainings can be just one visit or several visits depending on you and your dog’s needs. Aunt Penny is the ONLY licensed Dogs and Storks provider in the Pittsburgh and surrounding areas. Private consultations can help you find an effective solution to behavior problems and training issues. We use no-force, positive-reinforcement methods of training backed by sound, scientific learning theory. 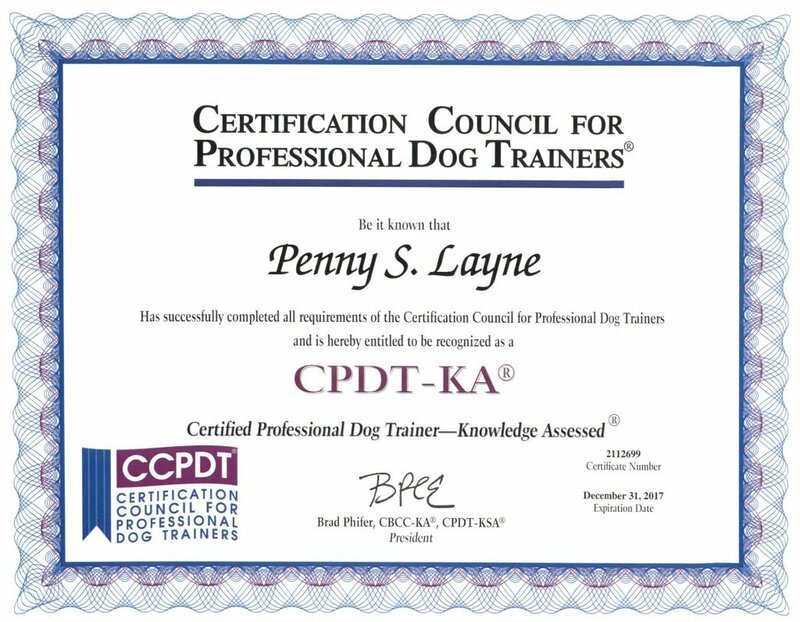 Penny Layne is a Certified Professional Dog Trainer who will work with you to develop concrete and realistic solutions to the problems you are facing with your dog, then give you the tools and support you will need to teach your dog good behavior or improve obedience skills. Extremely informative. All signs and signals we were told about are absolutely right on. Penny is a true professional. Check out - Dog Ready For Baby which INCLUDES the DOG in a small group class. Penny Layne - Nationally Certified Professional Dog Trainer and licensed presenter for Family Paws Parent Education will come to your house to help you increase safety and decrease stress! Aunt Penny is the first (2011) and ONLY licensed Family Paws presenter in the Pittsburgh and surrounding areas. A report to your vet so that they can see you are working with your dog in case we need to ever consult them for meds. Your family including grandparents, babysitters and even the dog are invited to be there! Private Dog and Baby Safety Consult – quote depends on location and sessions needed. What do we need to do to schedule a private consult? What topics can we discuss at the private consult? ANYTHING that concerns you about your dog’s behavior with your baby/toddler. Can you tell me more about the GROUP class called Dogs and Storks at Magee Woman's Hospital? This is a 2-hour presentation that has been ranked as a favorite for many years! There are handouts for this class that will be given out at Magee Woman's Hospital OR you can even download them from our website AFTER you attend the group class. They are password protected. You may bring something to drink and or eat if needed. To register at Magee Woman's Hospital call 412-641-8096. To see when the next DOGS & STORKS group class is, see our calendar. Do you offer a GROUP class WITH the dogs BEFORE the baby is born? Yes, that class is called DOG READY FOR BABY Please go to the calendar to see when the next Dog Ready For Baby class is being offered. They are held four times a year. There are no children permitted at these classes. Penny Layne - Nationally Certified Professional Dog Trainer and licensed presenter for Family Paws Parent Education will come to your house to help you prepare for your new puppy! My philosophy is grounded in gentle FORCE FREE methods that encourage the relationship between dogs and humans based on mutual trust and respect. We do not use choke chains, shock collars, prong collars or retractable leashes in any of our training classes or consults. Need help locating a puppy? Anxious about your new puppy? Not sure how to prepare or what to buy? Confused by all the advice your friends give you? Want to get your puppy off on the right paw with a professional dog trainer? How do I schedule a PRE-PUPPY Consult? Relax and know you are getting the best for your new puppy! What is included in the pre-puppy consult? Resources including VETS, Pet sitters, Dog Walkers, Boarding info and more! How much does a PRE- PUPPY Consult cost? The price is determined by your location and the answers on the pre-puppy consult some people need Aunt Penny to go to shelters or breeders to look at the puppies before they make a decision, while others just need one in home consult. Schedule your private consult with Penny now! Ready to turn your dream picture of the perfect family dog into a reality? We have ALL the tools and support you’ll need to make it happen. Check out the video below to find out about our specialized fun, effective and 100% positive family training package.